Radhanath Swami’s dietary supplements were sent by an acquaintance in the United States. “Did you request for it, or did he send it on his own?”Radhanath Swami asked me. “He sent it on his own,” I blurted out a lie. I was pushed by a surge of subconscious fear, a fear of causing him pain. Bothering anyone for his personal needs was something that his humility couldn’t tolerate. But the next moment, I found myself in an avalanche of guilt, “How could I lie to him, my spiritual preceptor?” And now, I saw that I didn’t even have the nerve to admit my lie! I walked out his room, my mind clouded by mixed emotions. I sought relief in the chanting of the holy names on a veranda outside. With closed eyes, I fingered my beads. “Are you sure he sent it on his own?” Radhanath Swami’s voice broke my meditation and I opened my eyes. He stood right in front of me. “Yes,” I blurted. He smiled and went for an evening walk. Off guard, I had again succumbed to the push of my subconscious mind that now wanted to hide my first lie. My guilt compounded. I had lied for a second time! And the thought of confessing before Radhanath Swami scared me all the more . My mind tossed me in its waves of extreme guilt and fear. Was it going to kill me? As a defense, I pulled myself together and plunged my mind into the sound of the holy names. Hare Krishna, Hare Krishna, Krishna Krishna, Hare Hare, Hare Rama, Hare Rama, Rama Rama, Hare Hare. That sound slowly gripped my squirming mind and I felt peace. “Are you really sure he sent it on his own?” Radhanath Swami’s low voice brought me to the external world again. He had returned after his hour long walk. Before I knew, my subconscious mind barged in with a reply that barked out of my mouth, “Yes.” He smiled and went into his room. I now felt as if I were ruthlessly stabbed to death. I didn’t want to think anymore, for if I did, my mind would strangle my corpse. Mustering all courage, I approached Radhanath Swami and fell on my knees, “I have lied to you. It was I who requested for the dietary supplements.” Suddenly, I felt my life force reenter my body. “I guessed you were lying. 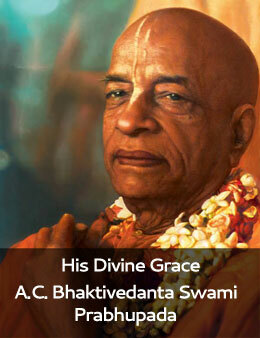 That’s the reason I asked you thrice,” Radhanath Swami responded gravely. I returned to my chores, but my vicious mind kept pulling on me, “How bad he might have felt that you lied! You have broken his trust.” Night eclipsed the twilight, but I had already lost hopes of a peaceful sleep. My mind wouldn’t let go of me. It was 9:00 p.m. when Radhanath Swami came to my rescue, after searching out my poor soul. He came to where I was and spoke with an affection that I will never forget, “Don’t worry. I still love you.” Tears of joy over-flooded my eyes and, struggling to restrain my bursting emotions, I bowed. How could his soft heart rest in peace, knowing that another heart burned in anguish? Guru always knows your mind. Good blog! I genuinely love how it is easy on my eyes and also the facts are well written. I am wondering how I could be notified whenever a new post has been made. I have subscribed to your rss feed which really should do the trick! Have a nice day! An exchange of extreme emotions–that’s what makes bhakti sweet. Thank you for sharing this. It has so many valuable lessons. This is a wonderful experience with Radhanath Swami which shows how a GURU can see through his students. Thank you very much Vikram pr for this nice and wonderful story. This has reminded me again that what come may, there is a recuer for me always provided I am sincere for following his instructions. Radhanath Swami is reallyg great. the kind of dealing shown in this incidence by Radhanath Swami Maharaj is very illustrative as to how one should deal with mistakes/lies of others, particularly the dear ones. HH Radhanath swami maharaj is so merciful ! Very nice experience, in fact I got hopes from this incident. Thank you so much for sharing us. Unbelievable! True saints cannot be deceived by our words since they see right into our heart and not our external superficial actions or words. Thank you for sharing this story of revealing tender heart of Radhanath swami. That is the greatness of Radhanath swami.He is very powerful saint so he could understand what is with in our hearts.Really amazing. H.H Radhanath Swami knows the heart of all of his disciple. Thanks for sharing. Maharaj is full of compassion and forgiveness..
Guru knows everything and is always compassionate and loving. We can learn quality of forgiveness from Radhanath swami life. Thank you for shearing. How could Radhanath Swami’s disciple tell a lie !! You have proved this. Thank you very much for sharing this episode.